Typical cat, cannot decide whether to go in or stay out! It came via email a very long time ago. This entry was posted in humour and tagged Humour on November 6, 2014 by Grannymar. I am a dog man myself! No ambiguities there! I am learning to be a doggy person. Hello Buffy! My sister had cats that would stand at the door meowing to be let out. I would open the door and they would not budge, just stand there looking at me like I had two heads! Cats learn that look right after they learn to use the litter box. This is so funny. Great way to smile at life. Smiling and laughter are the only way for me, my moans and groans are not one bit musical! Meow…escaped by a whisker I see. 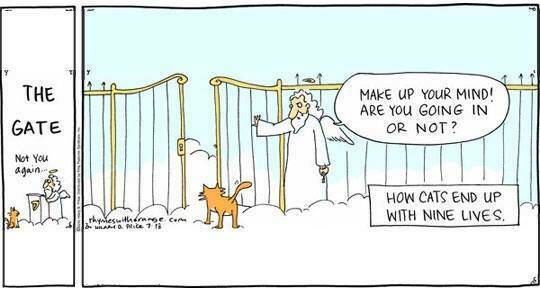 Well, given there’s nothing beyond the gates except more clouds, I’m not surprised the cat is hesitating. Now if there was a giant bowl of cat food a few yards away…. Or a mouse. Nick, that was the best answer today!